In No Justice, No Peace David Rapaport uses detail, insights, and anecdotes from over 150 interviews - with picket line captains, local executives, union leadership, journalists, mediators, and union and management negotiators among others - to provide an insider's view of the strike and its political and economic contexts, often told in the strikers' own voices. 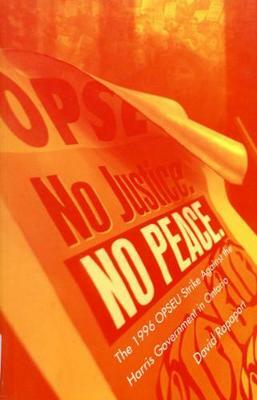 Vice-president from 1991 to 1997 of OPSEU's huge Region 5, covering Toronto, Rapaport describes how the election of the Harris government and the early "Common Sense Revolution" cutbacks led to a large opposition movement, the labour/social justice coalition, the Days of Action, and the province-wide OPSEU strike. No Justice, No Peace traces the politics involved, from ideology and belief in free trade to the downsizing of public and private enterprises, from the restructuring and privatization of the public sector to collective bargaining between OPSEU and the Ontario Government, and, finally, to the strike vote and the picket line.